It's back! Our Pink Elephant Rosé is a decades-old staple in our winery and on our tables because there's nothing more perfect on a warm day than a fresh rosé, served chilled. 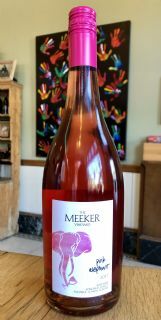 This Pink Elephant is a blend of 78% Merlot and 22% Cabernet Franc. The blend changes every year, but the style stays the same - dry, bright, and perfect for pairing. Enjoy!